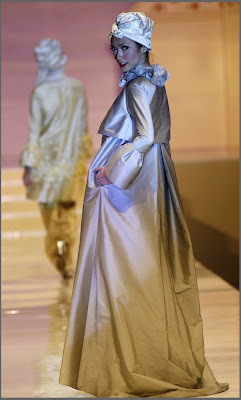 This year's Islamic Fashion Festival took place on 25th-26th of May in Jakarta, and featured a range of designers from across Malaysia and Indonesia. I think this year might be my favourite yet! You can see photos from previous seasons here. it's Jakarta, dear. Not Jakarata. lol. I love it all! Masha-Allah..I like the flow of the material and the colours too simply amazing! Wow I love Itang Yunasz's look. Proper hijab, although I like the way you can still see the outline of the neck and such. Not sure if it's proper hijab though... But I feel like it probably is. 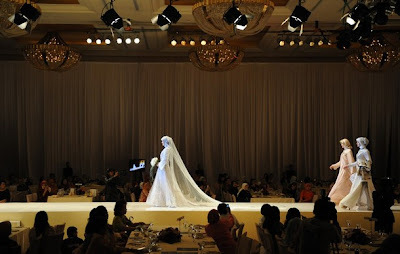 That Itang Yunasz dress - such a wonderful idea masha'Allah! Insha Allah She is will open online shop soon. 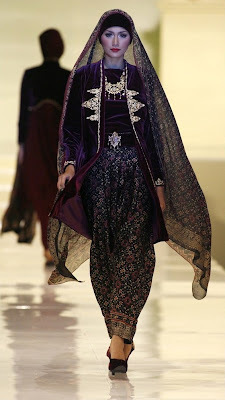 My favourite is Ghea Panggabean... it looks the most elegant and traditional Indonesian/Javanese.